Sunday next sees the club heading to Dundrum for the County Juvenile “B” Cross Country Championships which have a 12 noon start. 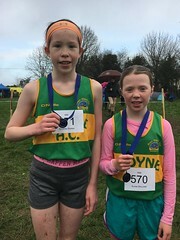 All juvenile athletes who did not feature in the medals at the County Championships in Two-Mile-Borris or Moyglass are eligible to compete as well as any newly registered club athletes since those championships. Entries close this Thursday night and Geraldine is currently taking names. The following are amongst those eligible – Sean Boland, Jack Reddan, Aaron Loughnane, Orla Duggan, Mary-Kate Ely, Sarah McGinley, Isabella Jones, Ruth Phelan, Mairead Duggan, Adam Phelan, Jack Gleeson, Ben Moore, Finn Jones, Fred Power, Alana Maher, Leona Maher, Martin Cleere, Liam Ryan, Cathy Hogan, Aisling Dwyer. Best of luck to all involved.